You’ve dedicated your life to helping others as an RN. Now, expand your patient-care skills with a BSN degree from Post University. In this program, you will have the opportunity to build upon your professional knowledge and experience and advance your current nursing career to leadership and advocacy roles. Nursing is an increasingly competitive field; a bachelor’s degree provides more opportunities for nursing jobs or career progression as hospitals, long-term care facilities, rehabilitation facilities, and outpatient clinics and offices look to hire nurses with bachelor’s degrees. It also opens doors for professional certification or graduate studies. Unlike other online nursing schools, our planned practice experiences are immersive. In each course, you will make real-life decisions and interact with colleagues and patients in a completely virtual context. At Post University, we understand the importance of personalized education, and we’re here to help you customize your nursing degree so that you can achieve your specific career goals. We offer 15 open electives and minors in Legal Studies, Emergency Management, Human Services, or Management and Leadership that can improve your skillset and further enhance your career or shift your area of specialty. To prepare students as professional registered nurses who have the 21st century nursing skills necessary to deliver innovative, evidence-based, patient-centered, and collaborative care to improve the well-being of diverse populations in local and global healthcare environments. 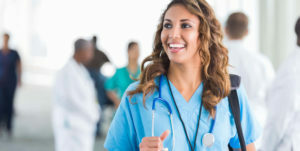 The RN-BSN program at Post University has a unique curriculum with practice experiences integrated throughout the curriculum. Transfer credit for Post University RN to BSN nursing courses (NUR designated) will not be considered for transfer credit. * Additional credit for pre-licensure nursing designated courses may be awarded on a case by case basis. **Awarded after verification of an unencumbered license to practice as a registered nurse (RN). The university reserves the right to change or update the curriculum at any time. The university will notify students of any changes officially through the university website. For full course descriptions please refer to the University Catalog for the current Academic Year. Graduates of our online RN to BSN program will have opportunities for employment and career progression that can lead to an expanded role as a provider, designer, manager and coordinator of patient care. Synthesize theories and concepts from nursing and liberal education to build an understanding of the human experience and improve quality of care. Apply leadership concepts, skills, and decision making in the provision of high quality nursing care. Critically analyze evidence and research findings for use in clinical practice. Apply technology to the acquisition, analysis, and dissemination of knowledge to support evidence-based nursing practice. Analyze personal, social, cultural, economic, political, environmental, local, and global influences on health and health care delivery. Demonstrate effective communication, teambuilding, and collaborative strategies when organizing the health care needs of clients. Demonstrate clinical reasoning when assessing, planning, implementing, and evaluating health care. Promote the professional image of nursing by applying standards of practice within an ethical decision making framework and articulating a philosophy of self-care and professional development. Plan holistic care that recognizes differences, values, preferences, and expressed needs of clients. Overall college cumulative GPA of at least 2.00 on a 4.00 point scale. Graduation from an approved registered nurse (RN) program; or enrolled in a nursing program preparing to become a registered nurse, and on track to graduate. An unencumbered license to practice as a registered nurse, or evidence of RN licensure eligibility. *Applicants of the Bachelor of Science in Nursing (RN to BSN) program must provide prior to admission the following additional information. Proof of an unencumbered license to practice as a registered nurse that is verified through the National Council of State Boards of Nursing (NCSBN). Maintaining an unrestricted, unencumbered license to practice as an RN throughout the duration of the program. Students who do not maintain a current unencumbered, unrestricted RN license will be dismissed from the program. Verification of a valid RN license is required to receive PLA credit for RN licensure (30 credits). The following states have provided approval to offer the RN to BSN program. Your search for an online RN to BSN program ends here, but your future is just beginning. Contact us to apply to Post University today to accelerate your nursing career. Applicants must have an unencumbered (unrestricted) license to practice as a registered nurse or be able to demonstrate evidence of RN licensure eligibility. The Bachelor of Science in Nursing (RN to BSN) at Post University is accredited by the Commission on Collegiate Nursing Education (http://www.ccneaccreditation.org). Find out more about Post's Prior Learning Assessment (PLA) Program.